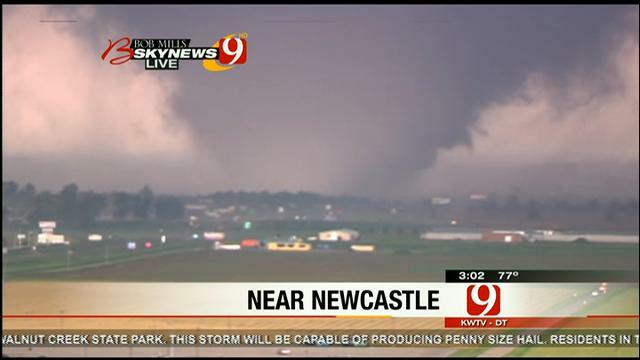 Another deadly and dreadful tornado rips through Moore Oklahoma at 3:15pm. It stays on the ground building in strength for an hour; until in a matter of seconds it fades and disappears from the sky. One minute it is unmistakeably serious, deadly, huge and seen for tens of miles; the next it looks like a thunderstorm. One minute the sky and the earth connect the next it is again separate. People below that sky are still standing agape and stunned. Still hunkered down and waiting for the “all clear” sign. Some…are no longer there looking up from below, but looking down…and they…they no longer have questions about anything…the least of which is “What on earth!! Why us? Where’s God?” No, those who were called home way before the sun came up that morning have all their answers. For those left behind…if questions are still stunted by shock and grief; they will come. If they have “seen it before” and therefore have no questions…they have either learned or they feel there is no sense in asking questions. For those of us who inevitably watched their lives turn upsidedown, there is a resounding thought. Everyone says it. How? How does one pray in such a humanly incomprehensible situation? How do you form words that encompass losses such as every news station and internet access site has laid out for the world to see? Groans are surely the only “words” possible for those in Moore Oklahoma and the many many others in various cities that have also been “touched” by the sky recently. Groans were my spirits first response. I am so thankful groans are mentioned in the Word of God. They mean something! Perhaps more than words! When I settled down this night, sitting and still…waiting for God to speak into the images that left traces outlined in my mind of Moore Oklahoma; this is what He said. Sounds harsh, huh? Sounds like a judgemental, hard God…and it would hardly be accepted as “comfort” by most…few but most shrink at such words. Its…inhuman! Yes, yes it is. But then…His ways are not our ways, nor His thoughts. And two things are always undoubtably true. His ways are carried out, swift and sure. His thoughts are the only clarity that can make sense in chaos. Job wrote about it for this purpose. His children were all taken by a storm. After God had taken all he had including his health. After the evil one had asked permission to afflict Job, after God said, “Do your worst, but do not take his life from his body.” No doubt had Job been a fly on the wall of that conversation he may well have stood agape at the Lord his God’s response. God’s will at this point would seem harsh…maybe even unfair. Hardly what humans call “loving or comforting”. To be clear – it is Gods job to Comfort. Not ours. At this moment and at 3:15-4:15pm He was on “the job. He did not stand aside and wait to love and comfort His children while a tornado wiped out city blocks. He may or may not have been implementing His justice. Its not for us to “know”. Whether He acts in such a way as we see justice or mercy; never changes that these are His hallmarks with all situations, everyday, no matter what humans believe or think. He is sure of His will, His Love, His methods, His acts and the results that follow. We can be, but its not necessary. God sent His Son exactly when and how and in the form He planned, totally independent of whether His creatures “approved” (and most did not – and still don’t). What we “get” is entirely up to us, depending on where we go to seek the enlightenment. Well for those with the provision and nearby…be a prayer! Help the needy and afflicted! Use all you got to “pray” with action. For the rest of us? I can not say what to “say” for anyone. But I will pray as instructed. Trusting the One I know is trustworthy, in control, sends chaos and disaster, wealth and prosperity. Truly I want none other than His Will to be done for all those who have been directly or indirectly affected by this. I know His Will holds more Love and Comfort than all the human words could hope to communicate. I also know…that I have no clue what exactly those people need from an eternal point of view. Carnally I can deduce (this takes no wisdom) that they need shelter, food, assistance, and community to support them. These request have and will continue to go from my heart to His ears. Yet in the light of all things…oh how I truly want everyone to know Yeshua (Jesus), the Father, and the Comforter like He is and better and more each day. This is my deepest desire. Yet, right now to say to someone who is grieving losses; “God’s will was done, be comforted.” Would be ill-advised (lacking wisdom). The best thing Job’s friends did was just sit and listen for the first few stanza’s of their “comfort”. All their words about God and His obvious ways towards evil were foolishness. They in the end were told by God to apologize and help Job by being a prayer. Words will come later…right now we weep for those who weep…and put elbow juice into comfort. Silence reigns after disaster…because God Himself wants to be heard. He alone can heal with words. 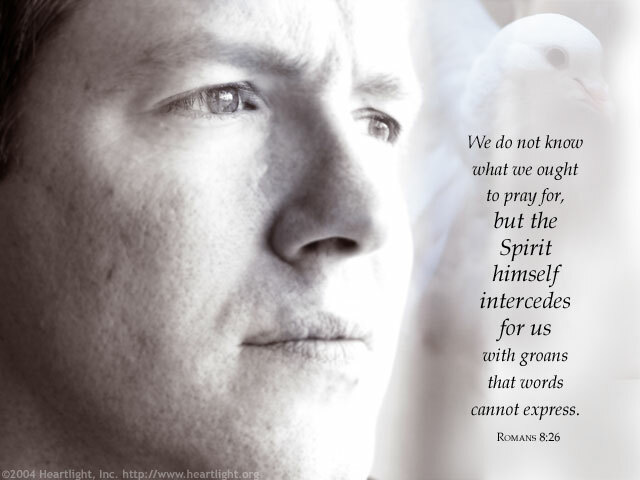 His Word alone, points to how to pray. Men are groaning in the city, the mortally wounded are crying for help, yet God finds nothing amiss! “God thunders wonderfully with His Voice, He does great things beyond our understanding. He says to the snow, ‘Fall on the earth!’ – likewise to the light rain, also to the downpour. He brings all human activity to a stop, so that everyone He has made can know it. Then the animals go into their lairs and hibernate in their dens. “Out of its chamber comes the storm, with cold out of the north. By the breath of God, ice is given, and the wide waters freeze over. He weighs the clouds down with moisture, and they flash forth His lightening. He, by His plans, turns them around, and they do what He commands them anywhere on earth; He brings them forth on the earth sometimes to punish, sometimes to express His grace. Then all his brothers and sisters came to him, also all who had known him before, and they ate a meal with him in his house. They consoled and comforted him for all the evils Adonai had inflicted on him. Since the days began, I have been He. No one can deliver from My hand. When I act, who can reverse it? Here is what Adonai says, your Redeemer, He who formed you in the womb: “I am Adonai, who makes all things, who stretches out the heavens all alone, who spread out the earth all by Myself. I am arming you, although you don’t know Me, so that those from the east and those from the west will know that there is none besides Me – I Am Adonai; there is no other. I form light, I create darkness; I make well-being, I create woe; I, Adonai, do all these things. “Heavens above, rain down justice; let the clouds pour it down. Let the earth open, so that salvation springs up, and justice sprouts with it. It is I who created the craftsman who blows on the coals and forges weapons suited to their purpose; I also created the destroyer to work havoc.